Curved Fascia Bracket. Also known as "J-pole" or "Hockey Stick" antenna pole. Heavy duty Tin Roof mount with adjustable stay bars. Fixing kit included. Heavy Duty Tin Roof mount with adjustable stay bars to installation of Satellite, TV and Mobile Broadband antennas to any corrugated iron roof. Fixing kit included. Wall or roof antenna mount with support bars. Designed to support up to 65cm satellite dish and large mobile broadband antennas. Support bars are fixed length. Fixing kit includes mounting bolts. Extend the height of an existing mast. Suits satellite dish masts such as the MNT1005 and 14CFIRMECO and "hockey stick" masts such as the 14BCFB06 and 14BCFB06. Universal antenna mast kit includes pole and the 14ATPMBKE Stay Bars. Select from antenna pole length of 1.2m, 1.8m or 2.4m. Strong support bar supplied with brackets to suit both corrugated iron and tiled roofs. No tile drilling or cutting required. Supplied with all screws and bolts. Heavy Duty Steel Gutter Roof Mount for Satellite Dish and Mobile broadband antennas. Ideal for any tiled roof. Slide a couple of tiles up, screw the mount to both rafters and slide the tiles back down. Comes complete with mounting screws & adjustable sliding leg to suit rafter / truss. Galvanised steel trusses & fittings. Pair of Universal Extendable Stay Bars. 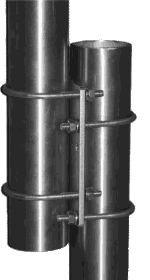 For Slant, Vertical or Horizontal Polarisation. Allows for Vertical, Horizontal and Slant (±45°) Polarised installation of radome LPDA and parabolic grid antennas. Use where Dual Antenna are installed for 4G internet services. These are normally "X-pol" (Slant) polarised. 6mm Bolts, 3mm Steel, Painted. Suits our larger 850MHz and 900MHz Yagi's. 5mm Bolts, 3mm Aluminium, Anodised. Suits our lighter 16dBi 1800 and 2100MHz 4G Yagi's. Also suits our 17dBi 2400MHz WiFi Yagi's. For Dual Yagi Antenna installations. Allows 2x LPDA and Yagi antennas to be mounted Slant-Polarized for MiMo configuration. Parallel - Omnidirectional Antennas to pole. Perpendicular - Dual Antenna Arrays. Mount Base Station antennas such as ANT530 etc. Mount Base Station Antennas to vertical mast pole. Two clamps are needed to securely mount larger antennas. Parallel - Mount Omnidirectional Antennas to a vertical pole. Two clamps are needed to securely mount the antenna.